As mentioned before, one of the reasons I started blogging was because of ginger ice cream. This is the nerdy way of making quick ice cream, quickly! 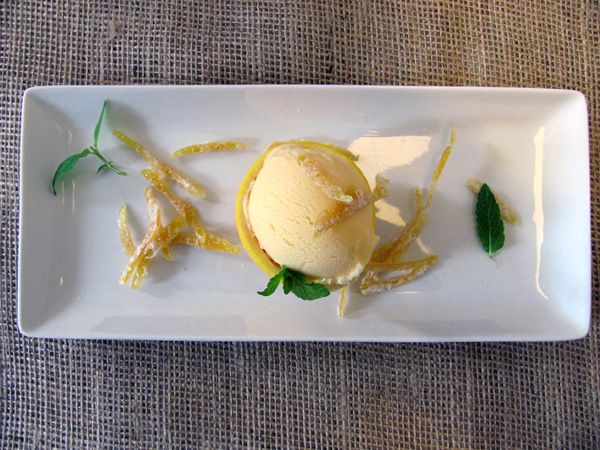 Here’s my White Truffle Gelato, with mint and orange rind candy. A small plastic bag to put your freshly made ice cream liquid into. A larger plastic bag that is a few times larger than the small bag. About 1kg of Ice. You can get this at most supermarkets. Place your yummy ice cream custard into the small bag and seal thoroughly, I cannot emphasise the importance of this enough. If it’s not sealed properly all of your ice cream will be ruined and the tears of a thousand puppies will pale in comparison to the anguish you will go through. Put the smaller bag into the big bag. Throw in the ice cubes, salt and the water. Seal the big bag and start to massage your ice cream bag as you move the salty, icy, watery blocks around. Keep massaging until the inner bag’s contents firm up to the consistency/thickness you want. This normally takes me between 5 – 10 minutes. Do yourself a favour and wear gloves or you could potentially give yourself frost-bite and have to precariously hold onto your ice cream cone with 2.5 fingers.